Saying that Fiverr is a great place to make some money on the side would be an understatement. Before getting started with the basics, let me assure you that Fiverr is not just for making money on the side. If properly worked on, Fiverr can be a full time job making you more than enough money for a living. It could be the dream career for you; sitting at home and making money. I personally know people who make thousands of dollars every month just from Fiverr. Heck, there are people who call themselves Fiverr millionaires. I think it's obvious why. 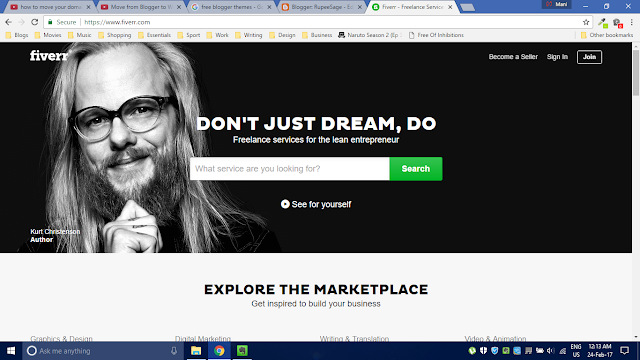 Having said that, freelancing with Fiverr will be successful only if you have the zeal to deep dive into it. You must possess the passion for your skill and a child-like enthusiasm to deliver quality service to your clients. If you can keep these things in mind, it is only a matter of time till you become a successful freelancer. And by successful I mean making loads of money ideally sitting at home. Starting with this post, I am introducing a series of blog posts that will teach you successful freelancing through Fiverr - from the very basics of it to advanced seller dynamics. If you follow my instructions carefully, I guarantee you that success will not be far fetched. But before counting chickens we must first let the eggs hatch. So, first things first. Let's start with the basics. As soon as you log in, go through the website. Get a feel of what is going on and how exactly Fiverr works. The basic idea of how people post ads (gigs) and how they manage to find clients. Don't just straightaway start posting gigs. You need to gauge the lay of the land. Most importantly, check out other gigs that you specialize in. If you are a graphic designer, check out other graphic design gigs. Know your competitors - how they work, what are their strengths and weaknesses, what is making their clients buy from them. Once you gather enough information about the website, your competitors and the business model, you are now ready to move forward to the next step. Before you proceed to create gigs, you will be asked to fill up your details. Details like your description, your skills, the languages you know, your experience in the field, your educational qualifications, any certifications related to the gig, your portfolio and your achievements. Share and fill in as many details as possible. The more you share, the better. Trust me, that's how it works. The idea is to instill credibility in the reader's mind. Be genuine and make your profile look like the work of a human. If possible, connect your profile to Facebook and LinkedIn to increase trust. It will help potential clients see that you are real; not some random computer bot. Eliminate the possibility that your profile may come across as a scammer with an unknown identity. To make sure it doesn't happen, add a professional looking photograph of yours. It helps build trust. Gigs are nothing but Ads that you post to attract clients. These are the commonplace where you meet your clients. They are known as Gigs in Fiverr terminology. Creating a gig is easy. Go to your profile page, click on the 'create a new gig' and fill in the details. Simple. Although, you have to be careful while creating a gig. Here are some things you must keep in mind before creating a gig. Target your audience through specific gigs. Title your gig to match your audience. Add appropriate tags to your gig. Start with a low pricing initially. Add a catchy thumbnail but don't click-bait. Congratulations! You have completed the first stage of starting freelancing with Fiverr. Once you do all this, ideally you should start getting inquiries from potential clients very soon. But life isn't always meant to be fair. If filling up the blanks on a website could fetch you clients, everyone would be doing it, wouldn't they? But that is hardly the case. Just like life, your Fiverr journey is full of obstacles too. Apart from the tremendous competition you face in the real world, people hate to be the first ones to buy services from a newbie. Thanks to the human status-quo bias, starting out becomes much difficult. People prefer experienced sellers more than a rookie. Needless to say, filling up the details and waiting for inquiries is not enough. Some more effort must be put to achieve the desired results. So what more can be done to fetch clients? Find out in my next blog to be released next week. Subscribe to get a reminder. Leave a comment or drop me a personal message if you have any questions. I'll be happy to help you out.